Fruit beers are something of an unknown to the average beer drinker. Many would say that's not a beer, it's a cider or that's a girls drink. In some respects they are right, fruit beers don't taste like your average beer and it has been used in recent years as a way for more girl's to drink beer. 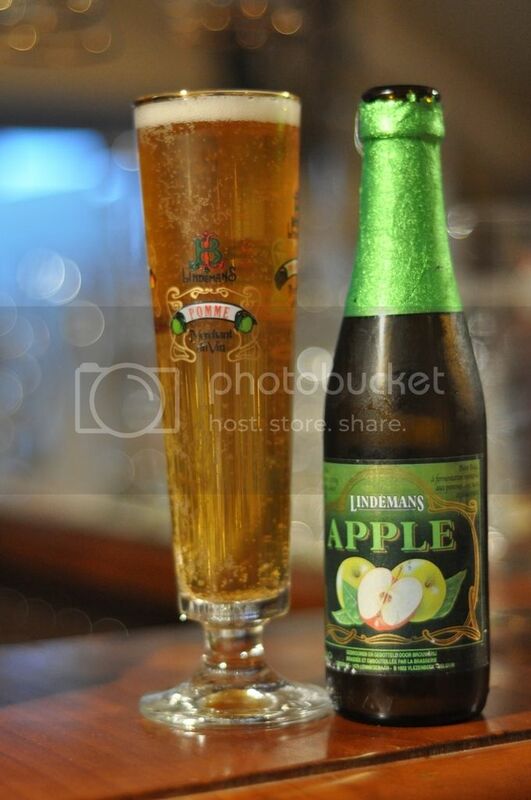 However fruit beers, particularly in Belgium have become some of the most famous beers worldwide. It pours like a beer which is a positive start. The colour looks pretty much like apple juice and the beer has a lot of carbonation, rising to a small white head. This head albeit small does hang around for most of consumption, it's a very pretty looking beer all in all. I think having it in it's own flute probably helps add to the overall appeal, anyway looks great! When one lifts the glass to their nose the apples come across incredibly strongly. Almost all I can smell is a sweet apple juice-like flavour. It smells rather sweet but has a late tartness that suggest that these are green apples. That is really all I can tell you about this beer, I'm hoping there are some hops to balance this beer or it may be far far too sweet! This beer will certainly divide people, it is unrelentingly sweet. The taste is of very sweet apples and strangely champagne. The apples are definitely green and have a lovely biting tartness about them which gives this beer an enjoyable sweet and sour taste. Seems more like a cider than a beer to me, but unlike other ciders I actually like this one! The thin body of this beer helps with it's drinkability, although I imagine after a couple of these it would be to sweet to keep drinking. Honestly this beer tastes like fizzy apple juice with a hint of champagne. Some people will definitely be put off with how sweet this is, as it is almost sickly sweet. However the beer has some good bite on the end which holds it all together. I would recommend that you buy this beer to try once on a hot day, and buy a few more for your lady, definitely more suited to the ladies this one. Still I would happily drink one in the afternoon sun, it's very refreshing.